One powerful feature of the theme system is called "Template Override Areas". 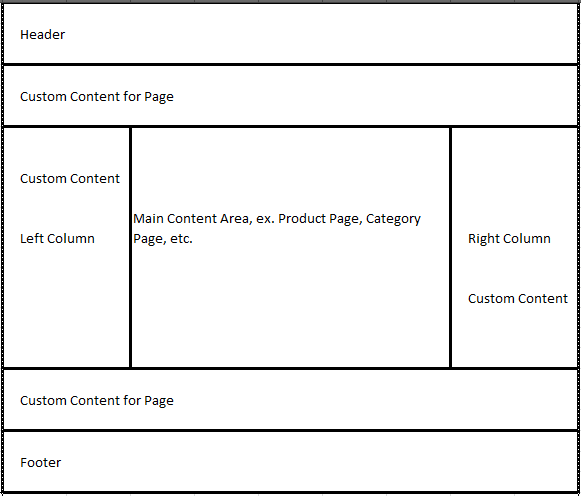 Template Override Areas allow you to place additional code into areas of your template other than the main content area. Placing a homepage banner across the entire width of the template. Placing a related items widget into the left or right column only on product pages. All our themes by default come with several template override areas standard. You will see the <ac:templateoverridearea id="NameOfArea"> </ac:templateoverridearea> tags throughout the template. For example in the following template code there are 3 template override areas. The second, HeaderAddonArea, will allow you to insert content directly under the header. This is put above the content area and left/right columns. The third, LeftColumn, will allow you to completely override the left column on certain page types. To tuse these areas, you'll need to create the same tag on the page type you are wanting to override the area on. The <ac:templateoverridearea id="NameOfArea"> </ac:templateoverridearea> tags need to go above the <ac:pagelayout> tag on the page layout. By placing <ac:widgetarea> tags inside the <ac:templateoverridearea> tags you will create a drag/drop region which allows for dragging and dropping widgets in and out of these areas. If you want to completely replace the Left/Right column remove the $$LEFTCOLUMN$$ or $$RIGHTCOLUMN$$ merge codes.